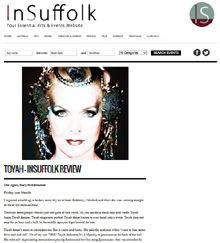 A great review, of Toyah’s Crimson Queen/Greatest Hits…Live! gig at The Apex in Bury St Edmunds, by In Suffolk. I expected a build-up, a fanfare, some dry ice at least. Suddenly, I blinked, and there she was : coming straight at me at 100 miles an hour. There are some people who are just not quite of this world. All you can do is stand back and watch. Toyah leaps. Toyah dances. Toyah sings note perfect. Toyah doesn’t seem to even break into a sweat. Toyah does not stop for an hour and a half. In the middle ages you’d get burned for less. Toyah doesn’t mean to intimidate me. She is warm and funny. She asks the audience if they “want to hear some 80′s rock and roll”. We all cry out: “YES!” Toyah dedicates It’s A Mystery to pensioner at the back of the hall. She tells self- depreciating stories about playing holiday camps and how her song Spectacular, that was intended for the 2012 Paralympics, ended up being used in Patsy Kensit’s Weight Watchers commercial. She laughs with us. She makes us feel she doesn’t want to be anywhere but here. Toyah is truly in the moment. • Continue reading at In Suffolk. Browse all of Dreamscape news on the Crimson Queen tour here. View photos from The Apex and other dates at Dreamscape Gallery.